Sen. Bernie Sanders (I., Vt.) is happy to demonize wealthy Americans. He has accused the "millionaires and billionaires" whom he so despises of destroying American democracy, called for a "political revolution" against them, and identified their "insatiable greed" as a threat to the country. Clearly Sanders has firm beliefs about right and wrong, grounded in his own moral code. There is no hesitation, no equivocation in his condemnations. Yet when it comes time to condemn anti-American autocrats, Sanders is alarmingly hesitant and equivocal. The latest example came Monday night, when CNN anchor Wolf Blitzer asked the senator why he has "stopped short" of calling Venezuelan leader Nicolás Maduro a dictator. Sanders paused for a few seconds and shifted his weight uncomfortably, with a pained expression on his face, before answering. "I think it's fair to say that the last election was undemocratic," he said. "Uh, but there are still democratic operations taking place in that country. The point is, what I am calling for right now is, uh, internationally supervised free elections." Democratic operations? Did Sanders not read about Maduro's regime using military force over the weekend to prevent American-supplied food and medicine from entering Venezuela to help the country’s suffering population? Did he not hear about Maduro's socialist policies and authoritarian rule creating a country on the verge of collapse, where the people are starving and hospitals are unable to provide basic medical services? Maybe Sanders was referring to Venezuela's legislature, the opposition-controlled National Assembly. But its leader, Juan Guaidó, declared himself interim president last month in opposition to Maduro precisely because Maduro is a dictator. Perhaps Sanders has his own criteria to distinguish between dictatorships and democracies—criteria that remain a mystery. In his answer, Sanders never called Maduro a dictator, nor did he call on the autocrat to step down from power, continuing a disturbing pattern. There is something wrong when Sanders can so easily condemn American corporate executives as morally abhorrent but cannot do the same for a foreign dictator who starves his own people. The senator gladly proposes legislation to punish the executives but refuses to support action by his government to pressure Maduro to leave power. This double standard is more than an isolated inconsistency. Indeed, it is part of Sanders's larger worldview, in which America is immoral and always at fault; any show of strength abroad is an exercise of nefarious imperialism. No matter how immoral or dangerous the situation, the United States has no right to try to make it better, and will likely make it worse. In fact, Washington probably helped cause the trouble in the first place. American power is not something of which to be proud, nor to exert in a forceful way. Just look at how Sanders's foreign-policy adviser, Matt Duss, addressed criticism over his boss’s refusal to call Maduro a dictator. "This whole question of ‘why won't you condemn Dictator X?' is a game that Washington hawks play to reaffirm the interventionist status quo, and Bernie won't play it," Duss wrote on Twitter. In other words, efforts to condemn Maduro do not grapple with legitimate moral and strategic issues. Instead, they are tricks played by "hawks" to maintain their imperialism or neocolonialism—whichever term Duss was most taken with in graduate school. If this logic sounds like a conspiracy theory, that is because it is. Given this worldview, what would Sanders's foreign policy look like as president? Ryan Cooper, a national correspondent at The Week.com, wrote an article this week titled, "How Bernie Sanders would dismantle the American empire." In the piece, Cooper writes that, "in the democratic socialist tradition, fighting imperialism has usually been a top priority (the vast Soviet empire notwithstanding). Sanders has the most thoroughgoing critique of American empire of any major candidate" in decades. The goal of Sanders's foreign policy, therefore, would be to roll back American power, and all of its imperial vestiges. To that end, Sanders has called for massive cuts to the defense budget and for the United States to be no longer dominant on the world stage. He is also determined to drive a wedge between Israel and the Democratic Party, creating an intraparty debate about America's support for the Jewish state, which Sanders and like-minded progressives view as the ultimate crime of American foreign policy. As Cooper notes, Sanders has also "called for the creation of an international movement working towards ‘democracy, egalitarianism, and economic, social, racial, and environmental justice,' in order to combat the manifest appearance of ‘a growing worldwide movement toward authoritarianism, oligarchy, and kleptocracy.'" That all sounds nice, but what does it mean? Duss provides an answer of sorts in a new interview. Sanders "sees the U.S. as a kind of global facilitator by virtue of our enormous economic, diplomatic power," Duss told Business Insider. "The U.S. has the ability to bring parties, states, and people around tables to address common challenges that really no other country has." "That doesn't mean that the U.S. needs to run to the head of every parade or be in charge of everything—certainly not," Duss continued. "But the U.S. does have a role to play in facilitating multilateral cooperation, conversation, and innovation." 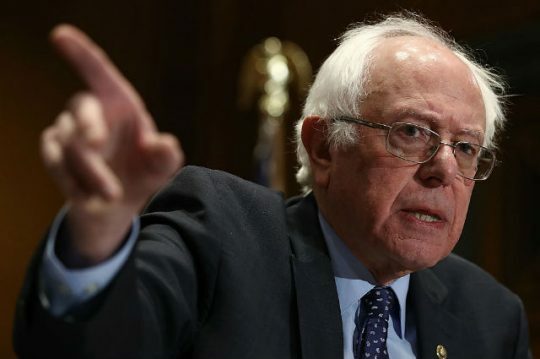 Bluntly, Sanders's goal is to destroy American power, to render the United States the host of international tea parties where leaders discuss high-minded issues at self-aggrandizing forums. It is a naïve view of the world. Sometimes dialogue is not enough. Indeed, deterrence through military force is one of the fundamental keys to global stability, yet Sanders considers it a relic of a time long past. As American power wanes, adversaries will take more risks, creating graver threats and more instability. Leaders in China, Russia, and Iran will not stop their drives for regional dominance just because Sanders is willing to sit down with them. True, diplomacy and other forms of dialogue must play an important role. But without the threat of military force, the United States will often have no leverage to achieve progress through diplomacy. Just look at the Obama administration's failed attempts to negotiate a resolution to the Syrian conflict. Sanders's worldview is built on a false premise. The historical record is undeniable: American power has done more to spread freedom and prosperity throughout the world than any force in human history. The military has liberated countless individuals and provided the stability for the modern economy to work. A world in which the United States is less active and powerful would be much darker, much further away from the egalitarian vision that Sanders seeks. Americans should be concerned about Sanders's views on foreign policy. The senator will be one of the favorites in the 2020 Democratic presidential primary, and he has made foreign policy one of his chief focuses. As he continues to push the Democratic Party further to the left, more candidates will adopt his stances. In this political environment, the American people must remember that their country is a force for good in the world, their military the greatest liberator in history. Such international engagement has brought unprecedented wealth not only to far off lands, but also to the United States itself. Come to think of it, an American empire does not sound that bad. This entry was posted in National Security and tagged 2020 Election, Bernie Sanders, Democratic Party, Foreign Policy. Bookmark the permalink.